The Pinnacle – The Observation Tower | Kedo Zrt. An impressive, futuristic, 35-metre-high Observation Tower will stand in the southern part of the area as the tallest structure in the city. 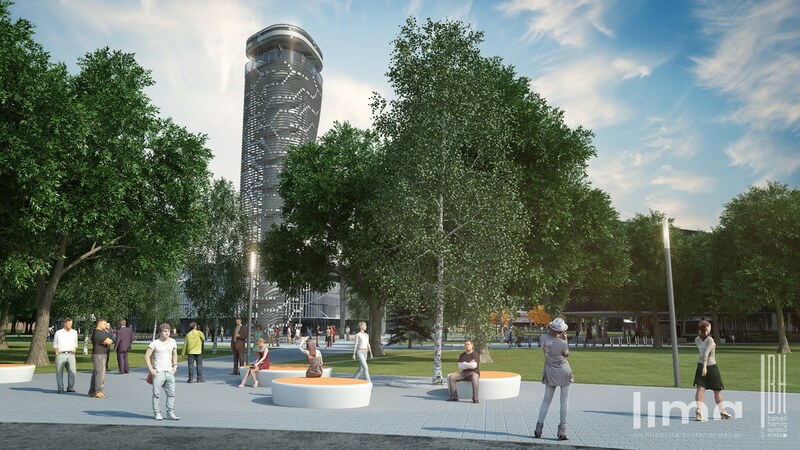 The tower will offer a scenic view of the Campus full of exciting shapes, the city of Kecskemét from a bird’s eye perspective, as well as mirages of the Great Hungarian Plain. The stainless-steel casing – the exterior of all the buildings of the campus – will give a special architectural character to the tower, also accessible through the skyway. To avoid the steps, there will be an elevator in the central core of the tower. One of the most significant landmarks of the complex is the elevated footbridge connecting old and new buildings of the Campus. The skyway will be open for pedestrians and will also be served by accessible elevators. The elevated skyway is to be connected to the Education as well as to the Administration Building at the applicable floor levels, then it will reach the central area between the two structures. From here it will continue its way into two different directions and will slope to the ground floor next to the Multifunctional Building after having circumvented the square. The observation tower is also going to be accessible via this elevated walkway.